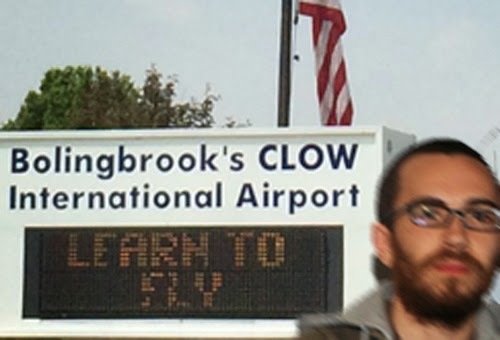 Godless comic Jamie Kilstein spotted at Clow UFO Base hours after a riot he participated in. What was promoted by Clow UFO Base as a fiery debate between progressive atheist Jamie Kilstein and conservative Christian Dinesh D’Souza turned into a real riot. By the time Clow’s security forces restored order, over 100 aliens and humans were detained. Damage from the riot is estimated to be around $10 million dollars. After the introductions in front of a crowd of aliens and humans, D’Souza started the debate with a 12 minute speech which many eyewitnesses described as rambling and confusing. During the speech, D’Souza accused President Obama of stealing the Ebola virus from the Martian Colonies so he could use it to destroy the “civilized world.” He added that Obama tried to be clever by starting the infection in Northwest Africa, but he wasn’t fooled. D’Souza also stated that the existence of alien Muslims proved the existence of Satan, while the existence of alien Christians proved the existence of God. Debate moderator Michael Nugent, who is also the president of Atheist Ireland, immediately declared D’Souza the winner of the debate. When Kilstein used another profane word, Nugent said he required an hour of uninterrupted speaking time to explain his, “nuanced and reasonable” decision. Goz Goose, from the Large Magellanic Cloud Alliance, was the first to attempt to storm the stage. Goose was immediately sprayed with a riot foam by The Men in Blue. Instead of being intimidated, others in the audience rushed at the stage. Seconds later, laser fire was exchanged between the crowd and security. In the confusion, someone gave the order to have Kilstein arrested. To everyone’s amazement, Kilstein defeated five Men in Blue in hand to hand combat. Thirty minutes later, security finally restored order. Kilstein was released after two hours in custody and suspended from Clow for three months. No such restriction was placed on D’Souza. Bolingbrook Mayor Roger Claar promised an investigation into the cause of the riot and said that there would be policy changes implemented. D’Souza’s parole officer refused to let this reporter speak with him. Kilstein could not be reached for comment, but his wife and podcast co-host, Allison Kilkenny, did comment.